Ross County manager Jim McIntyre insists they are good enough to win the League Cup after knocking out Inverness Caledonian Thistle. Goals from Jackson Irvine and Michael Gardyne either side of the interval were enough to see off a late challenge from their Highland derby rivals. Jim McIntyre's men are now in their first ever League Cup semi-final. "When you get to a semi-final, you have got to believe you can go on and actually win it," said McIntyre. "It's about winning the semi-final now." The Dingwall side got to the 2010 Scottish Cup final, but lost 3-0 to Dundee United, and McIntyre believes this year they can go one better. "'One game at a time' is our motto, as that is the way we work, and it is fantastic that we are in the hat for the draw," he told BBC Scotland. "Hopefully we can now take the next stage by winning the semi and getting to the final. "It's been a long time since this club had a day out at Hampden and the record in the cups has not been great. "We wanted to make sure this season that we tried to get to the latter stages and we have got to the semi-final now. "We are all delighted with that and especially from my point of view the bounce back from the defeat against Hearts as that was the poorest performance we have had this season. "It has shown me the character in the squad to do that in a week with three away games at Hearts, Inverness and Dundee United on Saturday." McIntyre's pleasure at the result was tempered by relief that he finally got one over their Highland derby rivals at the fifth attempt since replacing Derek Adams as manager. 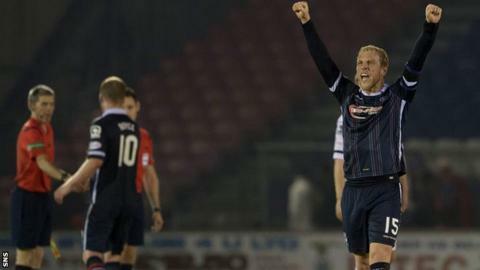 It was the first in seven games overall and the first time that Ross County have beaten Caley Thistle in a major knockout competition. Greg Tansey's 35-yard stunner set up a late rally for the home side, but the visitors held their nerve to progress. McIntyre added: "I'm thrilled with the result as it's been a long time coming beating Inverness. "For me we have had four attempts and not done it so it's nice to get that monkey off our back. "Our play was fantastic and we should have scored more goals as we had good chances to kill the game but didn't take them." Inverness manager John Hughes was disappointed at the result which leaves his side with just two wins out of eight at home this season. Injuries limited Hughes to being able to name just four outfield substitutes but he refused to use that as an excuse and was happy with the attitude of those fit enough to play. "We showed plenty of spirit and character and hit the post as well," said Hughes. "Tansey got a good goal, but we gave ourselves too much to do. "We need to become a little more streetwise, when to play, when not to play. I feel for them. They gave everything. "What we had on the bench is all we've got. "But you're looking over your shoulder at one or two in the stand - guys like Gary Warren, Ross Draper and Richie Foran who'd revel in that but that's where we are."